Lovely Calabay Parc Vila with Free Wi-Fi, Cable Tv and Beautiful Private Pool! 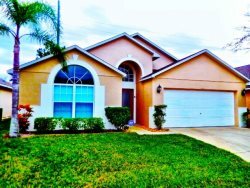 Beautiful house with cozy bedrooms, spacious living room , WI-Fi, and all needed appliances to make your stay as comfortable and pleasant as possible. Villa features private pool with beautiful lanai area and comfortable outside furniture to relax and enjoy the sun!This home is located in exquisite Calabay Parc Community! The prestigious development of Calabay Parc is located on Highway 27, approximately 5 minutes from Junction 55 of the I-4, the main highway from which all the Disney Attractions, Sea World, Universal Studios, Islands of Adventure and the main shopping malls are accessed.Calabay Parc is now firmly established as one of the most desirable communities for those wishing to vacation around the Disney and Orlando areas. It's only 10-15 min. drive to Disney Parks! And within 5 minutes drive you have access to Champions Gate Golf Course and shopping complex, this includes a large Publix supermarket, liquor store, video hire shop and popular restaurant chains, which delivers!